Gastric hernia is an anatomical disorder, which often does not cause any problems, but can cause symptoms that require the use of drugs and a special diet. Complications, which, fortunately, seldom occur, they can be repaired only by surgery. As noted in the introduction, gastric hernia in many cases does not cause any symptoms, but this disorder can be suspected in case of any signs of reflux disease - heartburn and regurgitation, feeling under pressure sternum after eating, lying down or during the bending of the body, when palpitations and arrhythmia occur. Symptoms of stomach hernia are pain in the upper abdomen that spreads to the back and then the shoulder and on to the neck, accompanied by difficulty in breathing, and sometimes suffocation, it can resemble the symptoms of a heart attack, which frightened the patient often leads to cardiologist. Hiatal hernia is often accompanied by belching, nausea and vomiting, and the symptoms that indicate that the disease has taken serious flow are difficulty in swallowing food (especially strong), the feeling of fullness after only a few bites, stomach pain, bleeding from the upper gastrointestinal tract manifested as vomiting of blood (fresh) or black tarry stools and consequently anemia. Gastric hernia is a relatively common disorder that means "falling out" of tissue from the normal position, and the term includes hernia (hernia) - punching through the body wall muscle. 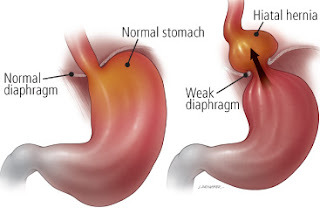 Hiatus hernia or gastric hernia occurs when the stomach break into the chest through the opening in the diaphragm, to the point where the esophagus from the chest passes into the abdominal cavity. In the majority of cases it occur from time to time, interfering with the normal function of the esophagus and the initial part of the stomach, especially the transport of food, and preventing the recurrence of gastric contents. According to statistics, the anatomical disorder occurs in a large number of people older than fifty years, but young adults also suffer from it, and gastric hernia is more common in women and obese people. The reasons why there is a weakening of the muscle-connective tissue and widening of the opening of the diaphragm through which the esophagus is still not fully understood. It gives tone to muscles of the diaphragm and hardening of the connective tissue are a natural consequences of aging, but also occur due to prolonged high blood pressure in the abdominal cavity. Factors contributing to disease like gastric hernia are obesity (especially one that includes a lot of fat in the abdominal area), physical effort, coughing, vomiting, constipation and straining during defecation, pregnancy. Endoscopy of the upper digestive tract. Check the function of the esophagus (manometry and pHmetrija). Type I, the so-called sliding hiatal hernia, characterized by periodically puncturing the stomach into the chest through the opening in the diaphragm. This is the most common form of gastric hernia and occurs in 95% of cases. Types II, III and IV are also called paraesophageal hernias and occur when a larger part of the stomach, sometimes a complete organ comes through an opening in the diaphragm break in the chest. What is the treatment of hiatal hernias? Treatment of stomach hernia depends on the symptoms, but also on the age and general condition of the patient, and other, associated diseases (especially cardiovascular system and lungs). Some patients do not bear the long-term intake of drugs that doctors prescribe for gastric hernia, which also has a big influence on the final choice of therapeutic procedures. Hiatus hernia treatment that is prescribed is aimed at maximum reduction of acid secretion in the stomach, and improving the function of the final part of the esophagus and stomach. Today there are very effective drugs that lead many patients to an immediate recovery. Other drugs should improve the discharge function of the esophagus and stomach do not have such a positive symptomatic effect. Surgical treatment is applied in the case of large hiatus hernia or those which are fixed to the chest cavity, or if the hernia causes bleeding, as in this case, which can lead to severe anemia. The first measure to be reckoned with is to treat gastric hernia with the implementation of specific, rigorous dieting, which combined with a reduction in body weight in many patients leads to a significant improvement in health status. In the following text we will give guidance when it comes to nutrition. First of all, we should take smaller, more frequent meals and avoid eating food four hours before going to bed, and if you are overweight, required to lose the body weight. It is also recommended to take a walk after meals. You should not wear tight clothes or bend the upper body forward. It is recommended to wear abdominal hernia truss, as well as the indispensable daily exercises for stomach hernia that will strengthen the abdominal muscles and diaphragm, as well as swimming and walking. Gastric nip (stomach twisting inside hernia) can lead to circulatory problems, and is most often manifested by severe pain. Gastritis symptoms often accompany hiatal hernia and can cause a number of complications. Returning of acid from the stomach erodes the lining of the esophagus and causes the constriction, which eventually leads to an inability to eat food. Often, due to the effects of acid in the upper parts of the stomach ulcer forms which causes bleeding and can lead to severe anemia. In the case of gastric hernia type IV happens to be in the chest, in addition to the stomach, the diaphragm breaks some other abdominal organs, which can cause strangulation or twisting of the stomach around its axis and cause severe pain. This is an emergency situation in medicine and requires urgent surgical intervention. It is suggested to eat five or more meals a day, at intervals of no longer than three hours. From the menu remove salty or acidic foods. Avoid too hot or cold foods that irritate the stomach. Proper nutrition with gastric hernia is crucial to the recovery of each patient, so take this time in order give you a list of foods that should be followed in consultation with your gastroenterologist. Gastric hernia in addition to medication is strictly controlled by diet and strictly forbidden are dough fried in oil, hot bread, rye and oats, whole milk, aged cheeses, sour cream, fatty, smoked and tough meat, processed meats, breaded and fried foods, ketchup, peppers, beans, green beans, olives, cabbage, Brussels sprouts, onions, canned vegetables, prunes, walnuts, hazelnuts, citrus (lemon, orange, grapefruit), chocolate, cream, fat cakes, too salty foods, hot spices, mint, coffee, carbonated and alcoholic beverages. Unglazed rice, corn, boiled wheat, yogurt, sour cream, cottage cheese, egg whites, horse and poultry, lean, fish, carrots, potatoes, celery, spinach, chard, squash, beets, zucchini, fresh fruit - melon, pear, tangerine, cherries, figs, grapes, honey, royal jelly, spices, parsley, cumin, fresh squeezed juices, green tea , soup, natural water. Hernia is treated mainly with medication. But if it is not possible to control the problems with medicine then operation is necessary. After a detailed diagnosis (gastroscopy, X-ray, CT MRI ...), before surgery it is required to implement pH metry and manometry (testing the mechanical function of the esophagus and stomach in order to establish patency of food and the state of the sphincter). Gastric hernia is operated by a classic laparoscopic method, which is much simpler and easier. The aim for esophagus and stomach to reinstate their anatomical position, after which the opening in the is closed by stiches. Then there is some kind of anti-reflux procedures to prevent the return of stomach contents into the esophagus, and at the end of the stomach is fixed. Patients after a day or two to leave the hospital. We hope that we have succeeded in this article to explain in detail what is gastric hernia and how it is treated.